New York City encompasses five different county-level administrative divisions called boroughs: Manhattan, the Bronx, Queens, Brooklyn, and Staten Island. These are among the one of the most busiest places in the world. Around 881,670 incidents related to motor vehicle collisions took place in these five boroughs between July 2012 and March 2018. These incidents resulted in the injury of around 316,305 people during the year. 1,467 people were killed in these incidents from July 2012 and March 2018. Where these incidents were reported ? Brooklyn accounted for most of the incidents (271,324) and was followed closely by Queens and Manhattan.The above distribution of incidents across the five boroughs are quite in accordance with the population . 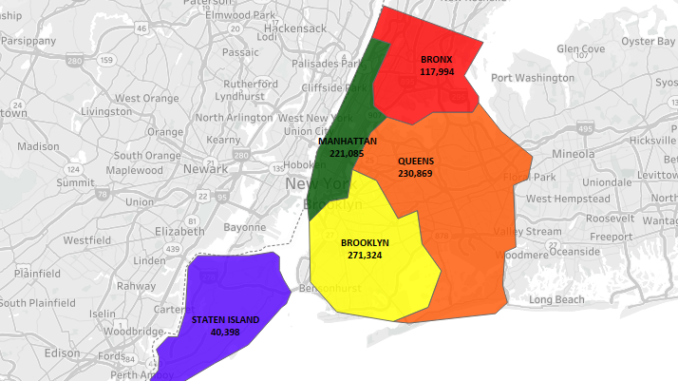 The population of these are in exact the same order, Brooklyn being the most populous and Staten Island being the least. What caused these Incidents ? 44.3% of these incidents were caused due to Drivers fault. A mere 4.1% of the incidents attributed to vehicular failure. Other factors contributed to more than 50% of the incidents. Let’s have a closed look into the Drivers Fault factors to see them at a more granular level. Among all the factors that were grouped into Drivers Fault, Driver Inattention/Distraction had the maximum share of 33%. Around 11% of the incidents took place when the Driver was Fatigued/Drowsy or Lost Consciousness or fell Asleep. Alcohol Involvement and Drugs accounted for only 2% of these incident. When did these incidents occur the most ? All the three categories of incidents ( involving motorists, cyclists and pedestrians ) had a different pattern when we look closely at the time and day that involved the most injuries for these categories. If we look into the timing of these incidents , we see dark colors for 8AM and (4PM-6PM) which can be considered as the busiest time when people are either going to their offices or returning back. A different pattern in found when we look into the months when most of the cyclist injuries takes place. The numbers are higher from the month May till September. The primary reason for this is that it is during these times Mat-September when the average temperature is around 25 degrees or higher which makes it the most pleasant time for cycling. After September the temperature starts decreasing and reaches negative during Jan and Feb making it tough to commute through cycles. Looking at the timing of the injuries we see a similar time frame as we noticed for motorist which relates these two categories a lot ( motorist colliding with cyclist ). A close look at the heat map for month and day reveals that more pedestrian injuries took place in the colder months as compared to the warmer monthns. Injuries were sparsely distributed over the weekends and more during the weekdays. Which Vehicles were Involved the most in the Incidents ? Passenger vehicles accounted for ore than 50% of all the incidents that occured in these Boroughs in the last six year. Around 25% of the incidents were attributed to Sports Utility Vehicles and Station Wagons. Buses and Taxis accounted for 5% for the incidents . How many people were injured daily ? The above graph shows us the 30 day moving average of number of people getting injured daily. An interesting thing to notice in these trends is that the number of person getting injured starts decreasing from December (marked in green ) and then peaks around June (marked in Red) for most the years across boroughs. Which are the most dangerous Crossroads ? Hope you guys enjoyed reading this.